SPONSORED LINKS There is more than one reason why historically women wore these things… And some of the reasons are pretty odd by modern standards. From warding off demons to stopping the bride making a run for it, there was a whole host of strange reasons women used to wear this simple item of clothing. Back in the day, when most weddings were arranged by fathers, the bride and groom probably wouldn’t meet until the big day. The bride wore a veil so that she could hide her face from the groom. Brides would hide their face until the very last minute, just in case the groom didn’t find them attractive and wanted to call it off. Awkward. In Roman times, brides tended to wear full-length veils, which would hide their entire bodies. These red veils were called flammeum and served a truly serious purpose. You see, the Romans believed that evil spirits might crash the wedding party and curse the newlyweds. So, they used the veil to confuse the spirits so they couldn’t curse the bride. 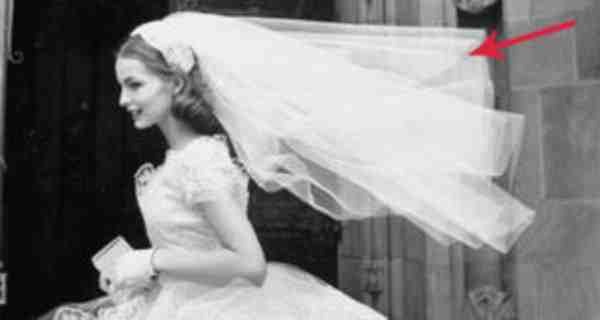 If a bride needed to prove that she was a virgin and ‘pure,’ wearing a veil was the best way to do so. The veil acted as a metaphor for the hymen, which meant that if it was intact, so was the bride’s virginity. Of course, everyone gets cold feet on their wedding day, but people used to genuinely worry that a potential bride would make a last minute run for it. Well, the massive veils and trains served the purpose of weighing them down as much as possible. That meant that it would be tricky for them to physically run. You know that cute little moment when the groom pulls the veil from the face of his bride? Well, it’s not quite as romantic as it may seem. In reality, this tradition is all about opening a present. The woman is symbolically the gift to the man. In the Jewish faith, there is quite a lovely reason that women choose to wear veils. It’s all about the man’s true love for his bride. The fact that she wears a veil proves that he loves her for more than just her looks. Aw, bless!